Meet your new favorite healthy summer appetizer idea! Actually, I admit that this is less of a recipe than it is a method, but it's genius all the same, and once you have it down, you can really make it your own. First you take a cucumber (I like the long English kind as they're generally pretty uniform all the length down), and remove a few strips of peel. This is totally for decorative reasons, and can ostensibly be skipped, but then you don't get the fancy peeled effect. 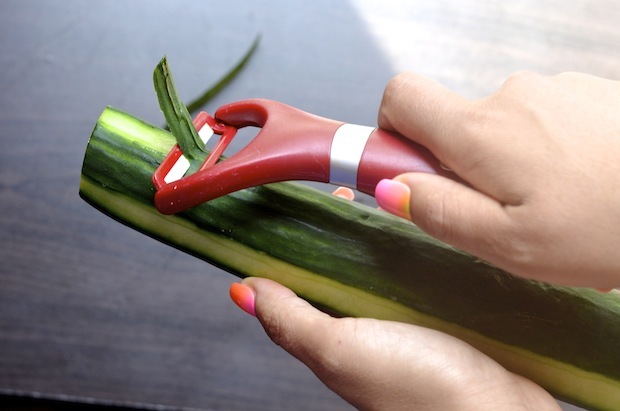 Now slice that cucumber into thick 1 1/2" pieces. Next, you take a melon baller or round measuring spoon, and you scoop out a little well from each slice of cucumber that you can then fill with something delicious. For this version, I used hummus (store-bought, although you can also easily make your own) and garnished them with some toasted pine nuts and chopped cilantro. So simple, but these were a huge hit the first time I served them, and disappeared in seconds. It's great when you want to be able to offer a lighter alternative to the typical bread/potato/chip-based apps. You can really have fun with these, too. Instead of hummus, fill them cucumbers with a fresh yogurt dip like tzatziki, smoked salmon cream cheese, egg salad, or tabbouleh. Or instead of cucumber, use zucchini that's been cooked until al dente, and fill it with a pesto cream or chopped tomatoes (similar to bruschetta topping). I always thought melon ballers were kind of a useless tool, but now I just want to scoop the hell out of everything. Use a melon baller or round measuring spoon, scoop out the center of each cucumber to form a hollow. 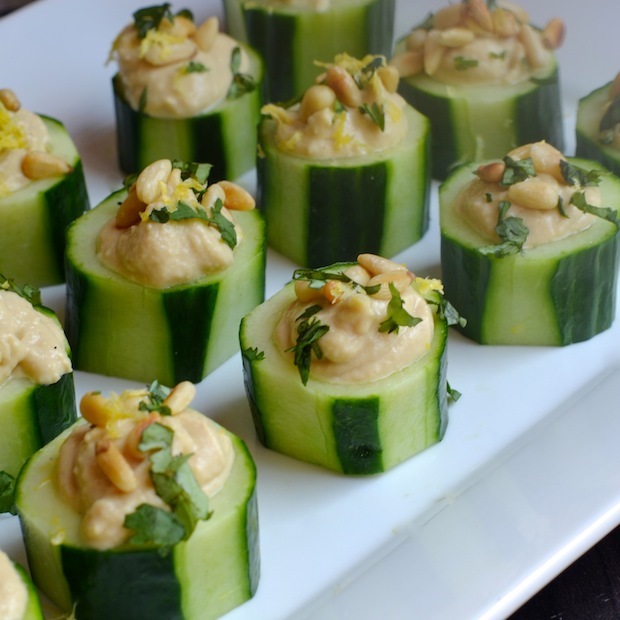 Season with kosher salt, and then fill each cucumber with a teaspoon or two of hummus. Garnish with pine nuts and parsley, and an additional sprinkle of salt. Arrange on a platter and serve immediately.